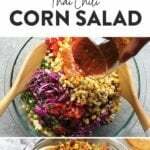 This Thai Chili Corn Salad is the perfect side dish for any time of year! 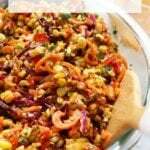 It is a healthy side dish that is packed with flavor. 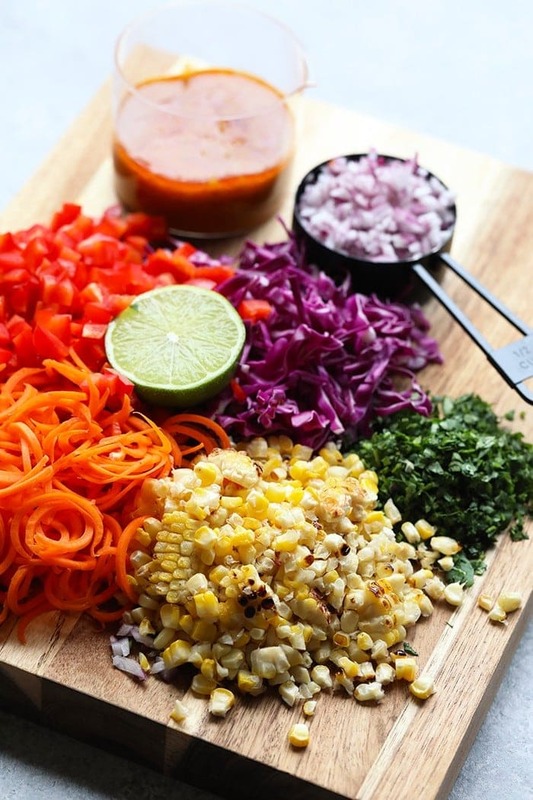 You can prep your corn on the grill or on the stove and add it to the rest of the veggie-packed salad. You just can’t beat the Thai chili kick and all the veggies. Make a big bowl for dinner this week. We are condiment and sauce people over here on Team Fit Foodie. Emily loves mustard, Lee can’t get enough ketchup, and I am obsessed with Franks Red Hot. You just can’t go wrong! 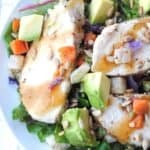 One thing we all love to do is use our favorite condiments as inspiration for dishes that we develop on Fit Foodie Finds. 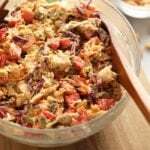 We have our Healthy Buffalo Chicken Salad Recipe that uses Franks + Greek Yogurt and a delicious mustard vinegarette on our Harvest Blackberry and Butternut Squash Salad. 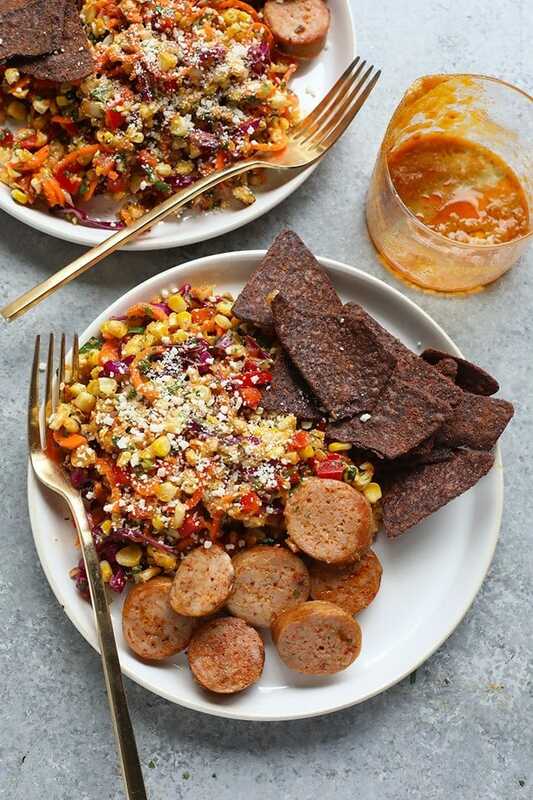 There are endless meal options when you get creative with condiments that already have delicious flavors! 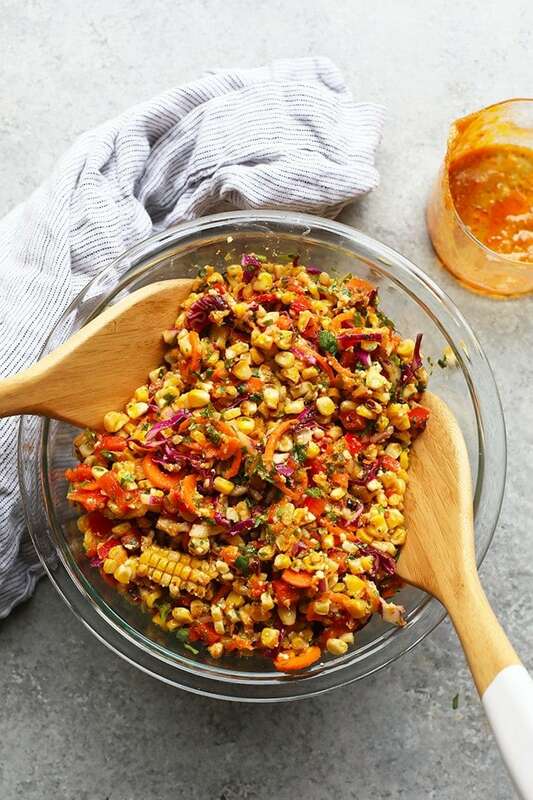 This Thai Chili Corn Salad was inspired by two of our most favorite Asian condiments, curry paste, and garlic chili paste. We absolutely love curry and we add chili paste to many dishes to give it a little kick. Do you feel me? Now, let’s chat about other reasons why this corn salad is delicious. Our inspiration for this salad came from my sister-in-law. She makes this AMAZING corn salad every Thanksgiving and it is bomb.com. 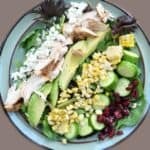 Her salad is a Mexican corn salad that is served a little bit warm and we skip the fork and scoop it up with tortilla chips. 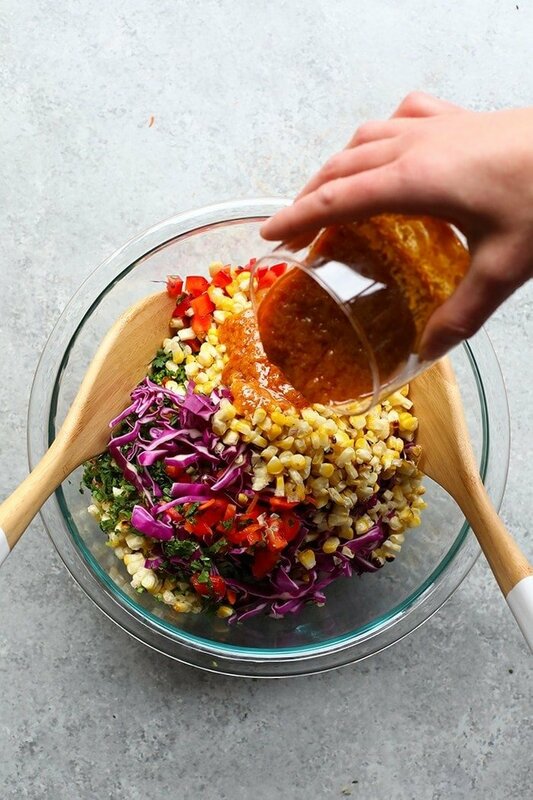 We couldn’t decide between a slaw recipe or a corn salad recipe, so we decided to do a smash-bang-fusion and did a corn salad and slaw combo! You guys, this corn salad recipe is going to blow your mind. 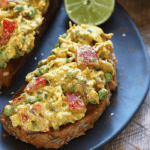 It is packed with so many veggies that you will be regular for weeks (and have some pretty epic #cornpoops). 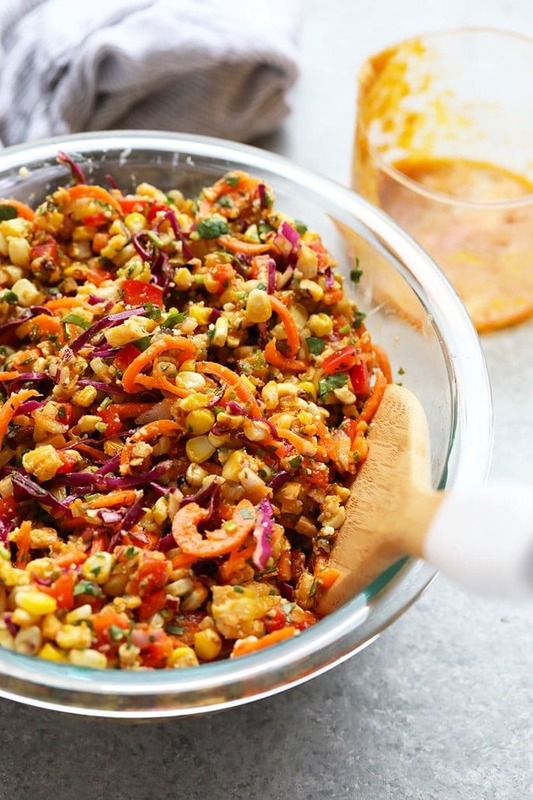 Thai chili, curry, and vinegar give this salad an amazing flavor that is light and fresh. The finishing touch is (of course) cotija cheese, that gives this salad just a little bit of saltiness that you just can’t resist! 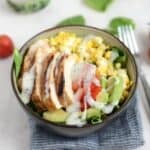 Now, make one of these Fit Foodie Finds main dishes to go alongside this mouthwatering corn salad. Preheat grill or oven to 400ºF and spray or wipe corn with olive oil. Place corn on the grill for 20-25 minutes, turning them every five minutes. While corn is on the grill place all ingredients for the dressing into a bowl and whisk until combined. Place dressing in the refrigerator for later. Next, spiralize the carrots by setting the Inspiralizer to Blade C. Cut off each end of the carrot so that you have a flat surface. Place your carrot into the spiralizer and spiralize into thin noodles and place in a large mixing bowl. Here are more detailed directions on how to spiralize a carrot. Remove corn from heat when corn has started to brown. Let cool and then cut corn off the cob with a sharp knife and add it to the large mixing bowl with the carrots. Finally, add red pepper, onion, cabbage, cilantro, cotija, and dressing to the mixing bowl. Stir until well combined. Place in the fridge for 30 minutes and enjoy.